Cieszyn is a small town with an old historical centre. This part of the town is full of historical buildings, small shops and service outlets, craft workshops, restaurants and cafés, which are all located along the main street. Sadly, more than a dozen of such places have disappeared over the past three years. So the first natural choice in the Human Cities project was to focus on the revitalization of the old town. We had an idea to build installation-seats inspired by local avant-garde stories. However, life had its own scenario. It was not an easy decision to change the main topic of our action, but the primary rule is to observe and follow people’s needs. When you observe them and then react, it improves your chances of building a real human city. The reconstruction of the train and bus station brought about a new challenge. There was a need to find temporary solutions in the city until the new station opens in 2018. A new location for the station was proposed – it was comfortable for travellers but definitely not comfortable for the residents and the conflict soon broke out in the city. In this difficult situation the team of the Human City project discovered that the problem could be turned into an opportunity for the town to improve the quality of the service. We got involved in the organization process of a temporary bus station. This meant cooperating with a big group of different participants: local government, transport companies, passengers of all ages and professions, small local business, etc. 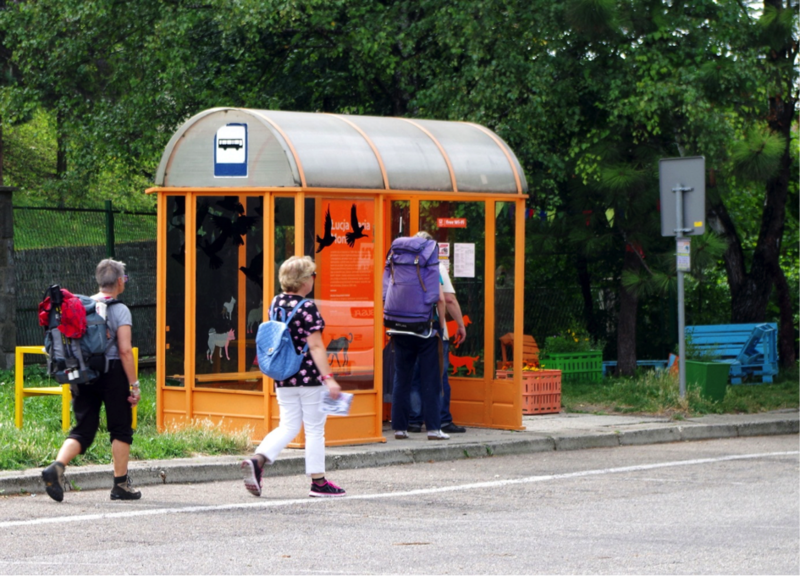 We started with designing visual communication for the temporary “Bus station”, than we moved on to the bus stops’ surroundings. We prepared a new timetable, built some furniture, planted flowers and provided some books. We tried to make the place as “human” as possible. The temporaty „Bus Station” is located close to Zamek Cieszyn, so the work around it has become our daily experience and joy. We are happy to run the Human Cities experiment close to real people’s needs. And more importantly, our municipality has decided to build an original visual information system for the tourists and residents.